We welcome you to join us at CORE Field Hockey Camp this summer for a unique field hockey instructional experience. The program is designed to help players take their game to the next level. Led by Katharine DeLorenzo, Head Coach of 2018 NCAA National Champions Middlebury College, the camp is designed to provide a high level of individualized instruction and feedback. With private assessments, one-on-one goal setting meetings with staff, and customized positional coaching, this camp will be limited to 50 participants. Staff will include offensive, defensive and goalie specialists that will provide advanced technical and strategic guidance to help you become a peak performance player. Check In: All Campers will have a private one on one morning assessment between 9am – 1pm on the first day of camp. Assessment times will be based on preference and proximity to camp. The all-camp opening meeting begins at 1:30PM on the first day. Check Out: Check out will be at 3:30pm on the last day. The nearest airport is Boston Logan International Airport in Boston, MA. You are responsible for getting yourself to and from campus, Revolution Field Hockey does not provide transportation. 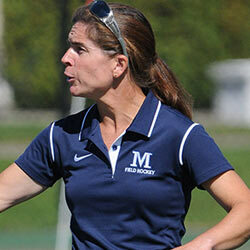 DeLorenzo enters her 18th season as the head coach of the Panther field hockey program. She came to Middlebury after serving as the head field hockey and lacrosse coach at Skidmore for the previous six seasons. DeLorenzo has led the Panthers to tremendous success over her 13 years, including an impressive 192-49 record. In that time, the Panthers advanced to the NCAA Championship game on four occasions with 11-straight trips to the NCAA Tournament (2003-13). She earned New England Coach of the Year honors in 2003 and 2004 while being deemed the NCAA Division III National Coach of the Year in 2003. The team also captured the 2003, 2012 and 2013 NESCAC titles. DeLorenzo graduated from Goucher College in 1990, where she was an All-American field hockey and lacrosse player as well as a swimmer. She was inducted into the school’s Hall of Fame in the spring of 2013. Following graduation, she attended Indiana State University where she earned her master’s degree in athletic administration in 1992. While at Indiana State, she began her coaching career with a two-year stint as an assistant field hockey coach for DePauw University in Greencastle, Indiana. In 1991, the Tigers advanced to the NCAA Tournament. After receiving her master’s degree, DeLorenzo took a position at Oberlin College in Ohio as the head field hockey and lacrosse coach in the fall of 1992, becoming an assistant athletic director during her third and final year. DeLorenzo began working at Skidmore College in the fall of 1995 as the head field hockey and lacrosse coach. She led the field hockey team to NCAA Tournament appearances in 1998 and 1999 and was named the UCAA (Upstate Collegiate Athletic Association) Coach of the Year in both of those seasons. She earned a six-year record of 69-37 at Skidmore, including a school-record 18 wins in 1999 when she was named the NFCAA Regional Coach of the Year. That season, her team also captured the UCAA Championship. She is an active member of several field hockey national committees, including stints with several rules committees, such as the IWLCA (Intercollegiate Women’s Lacrosse Coaches Association) National Rules Committee, on which she currently serves. DeLorenzo is also involved with the USFHA (United States Field Hockey Association) Futures Program.